People ask me my secret, and I tell them to use only the finest ingredients and all will come out fine. I use a mixture of chocolates from several different countries: Valhrona from France, El Ray from Venezuela, Schokinag from Germany, Callebaut and Cote d'Or from Belgium, as well as organic cream with no additives, Organic Valley butter, and, needless to say, the finest liquors. It all makes a difference. Untempered chocolate releasing flavor directly into the mouth makes a difference too, but unfortunately makes these problematic to ship. Usually it is people who come into contact with me who experience the bliss of Sensual Chocolates. People ask me, "Do you still do chocolate?" and usually I answer--at Christmas and Valentine's Day, absolutely, but otherwise, it's just when I feel like it in the cooler months. Lately I've been experiementing with alternative chocolates...like stevia & barley malt sweetened chocolate for diabetics or flax seed oil truffles (great for that time of the month!). 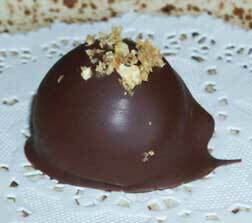 In the summertime, it's usually ice creams (a great "casserole" for leftover truffles! ), like chocolate bourbon or chocolate orange ginger... I toyed with the idea of doing chocolate as a business, but I found I really prefer graphic design after all. 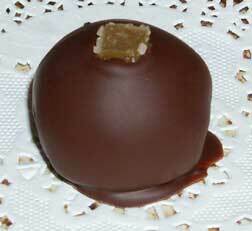 Bittersweet chocolate topped with toasted almond slivers and flavored with amaretto liquor. Has a mild almond flavor. 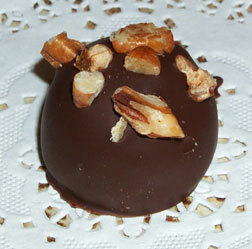 My favorite--bittersweet chocolate with Maker's Mark bourbon and chopped toasted pecans on top. Has a distinct bourbon flavor. 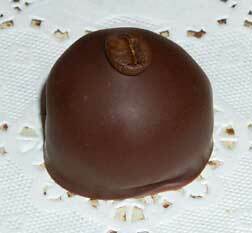 Bittersweet chocolate flavored with Bushmills Irish Whiskey and Copa De Oro liquors and topped with an organic Sumatra coffee bean. Bittersweet chocolate flavored with peppermint schnapps and and mint oil-flavored white chocolate drizzled on top. The mint in this is quite subtle. Bittersweet chocolate flavored with ginger "juice" and crystallized ginger on top. Distinct ginger bite. 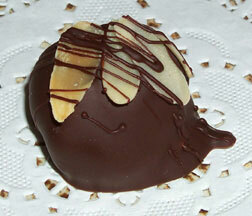 The original truffle that started it all (and the original picture to boot! 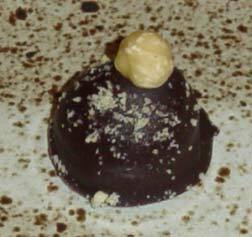 ), creamy rich dark chocolate ganache inside flavored with Frangelico liquor, topped with a whole hazelnut and dusting of crushed hazelnuts. Bittersweet chocolate flavored with lime oil and topped with grated key lime zest. Strong lime flavor. Bittersweet chocolate flavored with Carolan's Irish Cream liquor and dusted with cocoa powder. 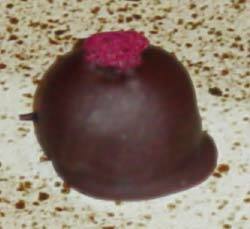 Bittersweet chocolate with organic raspberries, topped with a section of freeze-dried organic raspberry. The closest thing to a "just chocolate" truffle--bittersweet chocolate flavored with Kahlua and Grey Goose vodka and drizzled with dark chocolate. The flavorings are very subtle. 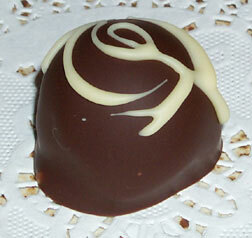 White chocolate flavored with Kahlua and Grey Goose vodka and drizzled with white chocolate. Here the Kahlua really comes through.